At 7 AM on Wednesday, March 13 we will have an early morning Ash Wednesday service, with the solemn blessing and imposition of ashes and Holy Mass. This service marks the beginning of the sacred Lenten season for us. “Many people have found in Lewis a fellow traveler in their spiritual journey, whether they are in a place of atheism/doubt or evangelical conversion. Those of course are well known parts of Lewis’ life, but his journey did not end in conversion from atheism to believer. Lewis’ journey continued into surprising places where even those from Greece, Russia and Turkey could see in him a friend on the Way. On Sunday, January 6, Bishop JOHN Abdallah and Fr. Edward Hughes will be with us to celebrate the Feast of the Epiphany. Bishop JOHN will also ordain Beau Bruce to the order of Deacons. Please join us at 10:30 AM for Mass. Our Christmas Eucharist will be on Monday, December 24th at 6 PM. Vespers for the Departed, a prayer service for the sake of the departed, will follow immediately after Evensong. Evensong for the Exaltation of the Holy Cross will be at the church on Thursday evening at 7:30 PM. Evensong for the Feast of the Dormition and Assumption of the Virgin Mary will be at 7:30 PM. Ash Wednesday (reader service) at 7 PM. Christmas Liturgy will be held on December 24th at 10:30 a.m. while Fr. Michael is in Atlanta. Matins will begin at 10 a.m., Mass at 10:30, and coffee hour with snacks following. Most Saints are commemorated only on the day of their death (or rather, their entrance into the presence of Christ). 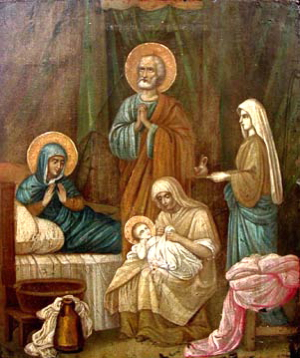 But the Church also marks the birth of three figures: our Lord, God, and Savior Jesus Christ himself, his cousin St. John the Baptist, and his mother the Blessed Virgin Mary. John and Mary have unique roles in the earthly life and ministry of Jesus, and thus in the plan of salvation God has worked for us. Join us Thursday, Sept 7 at 7 PM to learn about the birth of Mary, and how her entire life was set aside and sanctified for the glorious role she would play in the Incarnation of God. Commemorating the Dormition of the Blessed Virgin Mary with a Vesperal Evensong at 7:30pm on Tuesday, August 15. At 7pm we will have a Vespers service for our Patron Saint, Alban. Following the service we'll get dinner together. We will be having Evensong for the Feast of the Ascension at the church at 7:30pm. The day celebrates Ascension of Jesus forty days after his resurrection, and begins the holy nine days of prayer in anticipation of Pentecost. Stations of the Cross service from 7pm to 7:30pm. On Friday evening beginning at 7pm we will observe the Stations of the Cross followed by Evensong for the Feast of St. Patrick. On Sunday March 5 at 6 PM there will be a pan-Orthodox Vespers for the 'Sunday of Orthodoxy'. This is a wonderful time each year to gather with fellow Orthodox Christians from across metro Atlanta for worship, teaching, and fellowship. Following Vespers there will be a reception in the Carlos Hall attached to the Cathedral. For the second Sunday in Pre-Lent, Fr. Michael will be with us beginning at Morning Prayer at 10:00am and celebrating Divine Liturgy at 10:30am. The season of Epiphany concludes and the pre-Lenten season begins on Sunday, February 12 with Septuagesima Sunday. "Septuagesima", coming from the Latin for "seventy", is the Sunday closest to seventy days out from Easter. The three Sundays of the pre-Lenten season are all named for their proximity to the seventieth, sixtieth, and fiftieth days out from Easter, culminating in Ash Wednesday, the beginning of the forty days of Lent. On January 1, eight days after Christmas, we celebrate the circumcision of our Lord according to the Law, and the giving of his holy name, Jesus. On December 24th, at 11pm, we will be joining the congregation of St. Elias Orthodox Church in celebrating the Nativity of our Lord.